THE DON OF BEER (THE FERMENTED THOUGHTS OF BEER WRITER DON TSE) - Beers to You! As of April 22, 2019, I have sampled 21,546 different beers. "Mashing to the beat of my own drummer." You can help out The Don of Beer! Believe it or not, being a professional beer writer is not incredibly lucrative. You can help me out by signing up for eBates; if you sign up through the link on the right, I get a small referral bonus. I've been a member for over a year and love it! You get a small percentage of your online purchases (which you're making anyways) back in cash every few months. I'm also an Amazon affiliate. If you shop on Amazon anyway, by clicking on the links to the right (left if you're Canadian, right if you're American), I get a small percentage of your purchase! When you click either link, a new window will open and you'll shop on Amazon just as you normally would. There is no cost to you. I Started an Apparel Company! I started an apparel company! Sudsy Style is sells beer-themed clothing and active wear to help you stand out at your next beer festival, brewga class, brewery run or bicycle brewery tour. Check it out at www.sudsystyle.com! I am a freelance beer writer based in Calgary, Alberta, Canada commonly known as "The Don of Beer". This website is intended to share some of my thoughts on beer (and to a lesser extent Scotch). Why? Well...why not? I have the opportunity to try some incredible beers and whiskies and this is an opportunity to share some of my experiences with those who care. I write for publications around the world, but sometimes I need an extra outlet, usually to rant about something. Cerevisaphile: I am a beer lover. It's pretty simple, really. I've been tasting beer seriously for over 20 years. I'm pretty nerdy, so I take tasting notes of every new beer I try. I have sampled over 18,000 commercial beers. I am a BJCP Certified Beer Judge. I've judged professional and homebrew competitions around the world. I've been writing for beer, food and beverage and general interest magazines for over 10 years. My articles have appeared around the world (sometimes copied without permission ... GRRR!!!) and I've been quoted in publications such as All About Beer Magazine, Ale Street News, the Montreal Gazette, FFWD Weekly, Avenue and the PCMA Magazine. The video above is a little profile that a local cable company did of me as part of its local content programming. It was filmed during the 2013 Calgary International BeerFest. On October 17, 2013, I appeared on Calgary Now, a local access television show, talking about the growth of the beer scene in Calgary. I appeared with Dave Gingrich of Willow Park Wines & Spirits and Jim Button of Village Brewery. You can watch the entire show by watching the video on the right. I am a voting member of the North American Guild of Beer Writers. Uisgebeathaist: I like Scotch, too! In addition to being a cerevisaphile, I'm also a uisgebeathaist. About 15 years ago, I discovered Scotch and have developed a taste for other whiskies as well. When you think about it, whisky is basically distilled beer. Because I taste beer professionally, I take it pretty seriously and it takes up most of my time. As a result, my Scotch appreciation is more of a hobby. But I do know a thing or two about it and write about it from time to time. I enjoyed my 15 minutes of fame when I appeared on the long-running daytime game show, The Price Is Right. This was a life-long dream come true for me. Not only was I able to "Come On Down" and be a contestant on the show, but I was the winner of some great prizes, including winning my Showcase. 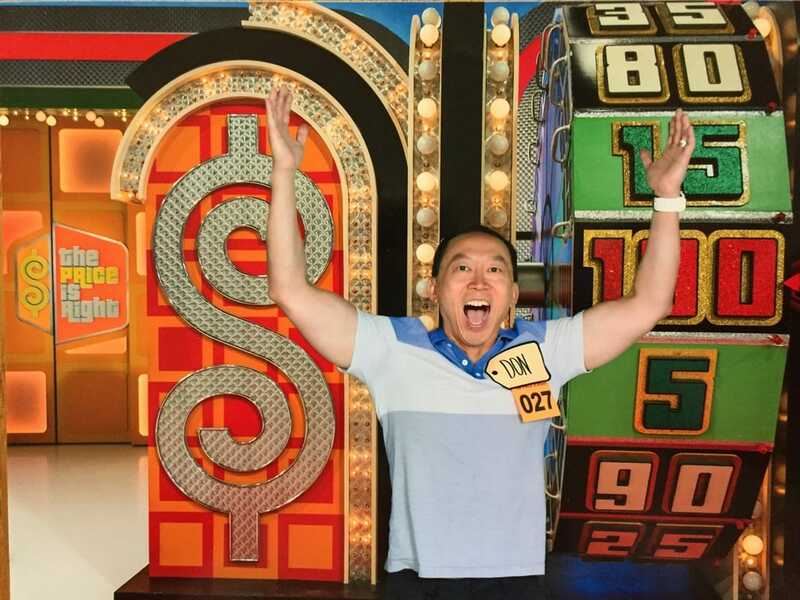 Don Tse from Calgary won his showcase on The Price Is Right. NewsTalk 1010 in Toronto also interviewed me. Unfortunately, I can't find an archive of that broadcast that I can link to. I realize that this has nothing to do with beer. But it's a pretty cool thing that happened, so I thought I'd share it here. Cheers! Do you remember the ALS Ice Bucket Challenge that went viral in 2014? Here is my video. I was nominated by Matt Lanigan of Brewsters Brewing Company. In turn, I nominated Andrew Ferguson of Kensington Wine Market, Marcus Brais of Brewsters Brewing Company and my very good friend Reverend Darren Wooff. I'll probably go to hell for that last one.